Juniper is not ‘just another’ plant in the Jungle; more than that, it owns myriad health benefits and the most astonishing remedial use is its power to induce apoptosis (programmed cell death) in breast cancer cells. It is also celebrated as the most common therapeutic plants used by the native North Americans. Beckoned as Hapusha in Sanskrit, Juniperus communis or the Common Juniper is also called as Aaraar in Hindi, Havusha in Bengali, Gin plant, Alpine Juniper, Horse savin and Fairy circle in English. Juniper has been a part of the Ayurvedic remedy of leucorrhoea, asthma, urino-genital infections, dropsy, gout, bronchitis, bladder and kidney stones, sluggish digestion, rhinitis, rheumatism and certain other water-retention disorders. Juniperus communis is an evergreen coniferous shrub in the Juniperus genus and belongs to the Cypress family, Cupressaceae. There are about 67 Juniper species spread across the world. Juniper has scale-like or needle-shaped leaves. The most soaring Juniper forest is located at an altitude of 4,900 meters in the Northern Himalayas and the South-eastern Tibet and is one of the tallest tree-lines on this planet. Nicholas Culpeper, the most renowned herbalist and physician of the 17th century prescribed the use of Juniper berries for treating sciatica, asthma and for speeding up childbirth. Juniper was used in folklore medicine for curing snakebites and poisonous stings. The Seminole Indians in Florida used Juniper for treating headache, swollen joints, diarrhea, stiff neck and common cold. Native Americans also used the berries as a female contraceptive agent. The indigenous Europeans burned the berries during the last three days of April as a ceremony for cleaning and guarding against sorcery. Juniper leaves were hung near the main door for preventing the entry of witches. Juniper was trusted to bring in good luck in love life and was burnt as incense for keeping away from insects, ghosts and evil spirits. Juniper is quoted in the Bible as the tree where Prophet Elijah hid. The leaves and berries of this plant have been used by the Tibetans for medicinal and spiritual uses. They believed that the burning of Juniper helped in breaking spiritual barriers, curses, hexes and protect from snakes and other venomous bites. It was used in Tibet for both religious and medicinal purposes. Herbal tea prepared with Juniper berry and leaves is been taken especially after meals for helping with digestion and for preventing bladder problems. Herbalists recommend drinking this tea in alternative days or as a part of your daily routine as an aid in flushing out the toxic remains in the system, support normal metabolic functions and aid in your weight-loss regimen by discarding the fluid withholding in the system. The essential oil of Juniper has rubefacient, astringent, antiseptic, carminative, analgesic, stimulant, anti-inflammatory, detoxifying, anti-rheumatic, diuretic, expectorant, anti-catarrhal, antispasmodic, neurotonic and sudorific properties. The major chemical constituents contributing to its healing values are about 90 percent of various monoterpenes, where as Juniper berry essential oil contains only 50-60 percent of it. Juniper leaf oil also has esters, terpinene-4-ol, antiviral and anti-cancerous compound known as DTP- deoxypodophyllotoxin. Ayurveda is a common sense science that simply goes with the saying “There is no smoke without fire”. In a much similar manner, Ayurveda states that every illness has a root cause behind. Identifying it and treating the root cause of a disease instead of its symptoms, is the secret behind the success of Ayurvedic healing in the treatment, prevention and voyage towards longevity. None of us can deny being a part of nature and that is the mantra of Ayurveda. It firmly indicates that all things in the universe are a component of Nature and everything is made up of the five fundamental energies known as Panchamahabhutas. They are space, earth, water, fire and air. Every person has a unique identity, which is an outcome of his/her unique individual constitution known as Prakriti. It is a combination of the three biological energies known as doshas (vata, kapha and pitta), which are an arrangement of Panchamahabhutas. Pitta (fire + water = metabolism, body temperature, leadership traits); vata (air + space = circulation, respiration, creative abilities); kapha (earth + water = reproductive functions, physique, sustenance, trust and love). Every individual has a distinct combination of these doshas with a predominance of any one dosha and it determines one’s physical set up, mental makeup, character, behavior/attitude and the depths of their spiritual being. Leading a well-organized life helps in retaining absolute balance with nature, whereas irregular eating habits, junk and ready-to-eat food items, sedentary lifestyle, climatic conditions, change in sleeping patterns, lack of physical exercise, work pressure, stress and certain other factors can pave way for imbalance of your system with nature. This leads to imbalance between doshas and thus, sickness steps in. Ayurveda is a holistic healing practice that prescribes natural remedies for striking balance with nature. It prescribes unique remedies for every person based upon their unique individual constitution, even for the same illness as it appreciates individual differences and trusts that every individual has a different mechanism that reacts to variations in their own way. Ayurvedic medications for the mind, body and the soul include herbs, plant essential oils, yoga, Ayurvedic routine, meditation, Panchakarma or the Ayurvedic detoxification technique, Abhyanga or Ayurvedic massaging and many other Ayurvedic therapies for complete cure and prevention of illnesses. Juniper leaf essential oil is recommended for pacifying kapha and vata dosha and for enhancing pitta dosha for trouble-free metabolic functions. Steam inhalation is an ancient treatment for instant relief from blocked nasal passages, sinusitis pain, headache and for attracting hidden toxins and excess oil in the skin surface. Steam inhalation with therapeutic herbs and medicated oils as per the medical condition and Prakriti of a person is one among the Ayurvedic detoxification technique known as Panchakarma. Swedhana or promoting sweat is the most suitable treatment for people with Kapha imbalances. Fluid retention is one among the kapha vitiations, which paves way for the buildup of ama or toxic remains. This slows down the normal functioning of the body and gradually weakens the immune power. When your body’s immunity reduces, the entry of micro-organisms like bacteria, virus and fungi becomes much easier. This paves way for cold, flu, chest and bronchial congestion and few other respiratory infections. 2 drops of Juniper leaf oil with 1 drop of Eucalyptus oil and 1 drop of Clove bud oil can help in loosening the phlegm and mucous deposits, open up the blocked nasal passages, alleviate pain and lets out the toxic remains by promoting sweat with its sudorific and diaphoretic properties. A refreshing steam inhalation blend for energizing the skin, especially the facial skin includes 2 drops of Juniper leaf oil with 1 drop of Rose Geranium oil, 1 drop of Palmarosa oil and 1 drop of Lime oil can work wonders on your skin. The antiseptic properties of this blend can help in soothing wounds or infections caused by acne. This treatment also helps in opening the clogged pores, removing dirt, dead skin cells and excess oil in the sebaceous glands, controlling the secretion of sebum and enhancing the circulation of blood in the skin with its rubefacient properties, allowing the skin to look supple and healthy. Rheumatism, obesity, edema, gout, renal calculi, bladder stones, congestion, inflammation, swelling and respiratory infections are kapha imbalances. Ayurveda recommends hot compress, Abhyanga or Ayurvedic massaging and warm bath diluted with therapeutic essential oils for treating water retention or kapha vitiations. Abhyanga is the primordial art of maneuvering the muscles, nerves and joints with the help of palms, foot, elbows and certain Ayurvedic techniques. Using Ayurvedic essential oils in massage, compress and medicated baths is the easy way for passing on the therapeutic values of essential oils to the bloodstream. Skin is by far the largest and prominent part of the human body just like the outer rind of bananas. Massaging your body with 10 drops of Juniper leaf oil, 5 drops of Ginger oil, 5 drops of Marjoram oil, 5 drops of Wormwood oil along with 3 ounce of sesame oil can work effectively in eliminating the surplus fluid deposits, toxic remains, salt, fat deposits and uric acid by influencing the frequency and mass of urine and sweat with its diuretic, sudorific, diaphoretic and detoxifying properties. This assists in reducing swelling, inflammation, redness, soreness, pain and muscular tension associated with arthritis, rheumatism and edema. The tendency to pacify vata imbalance along with the circulatory or the rubefacient properties of Juniper leaf oil helps in treating cellulites, pain, swelling and muscular stiffness related to varicose veins. It’s pitta augmenting properties help in stimulating the functions of liver and pancreas (normalizes the level of insulin) thus fostering secretion of bile, gastric juices and other digestive acids for relieving flatulence, colic pain and trouble-free digestion. An invigorating bath with 5 drops of Juniper leaf oil, 2 drops of Geranium oil, 2 drops of Orange bitter oil and 2 drops of Petitgrain oil can help in controlling the free radicals, relaxing the nerves, soothing the muscles, tranquilizing the mind and stimulating positive effects on the brain. This is an excellent remedy for treating cancer (especially in preventing the spread of free radicals, apoptosis or cellular death and cellular damage), alleviating stress, fatigue, anxiety and negative feelings. Taking this bath before bedtime can support you in sleeping tight and recharge your system for a new-fangled day ahead. Adding 2 drops of Juniper leaf oil with 1 drop of Lavender oil and 1 drop of Jojoba oil in gentle skin care creams and lotions for topical use on athlete’s foot, pimples, eczema and other inflammatory skin conditions can foster quicker healing with its antiseptic and antibacterial properties. 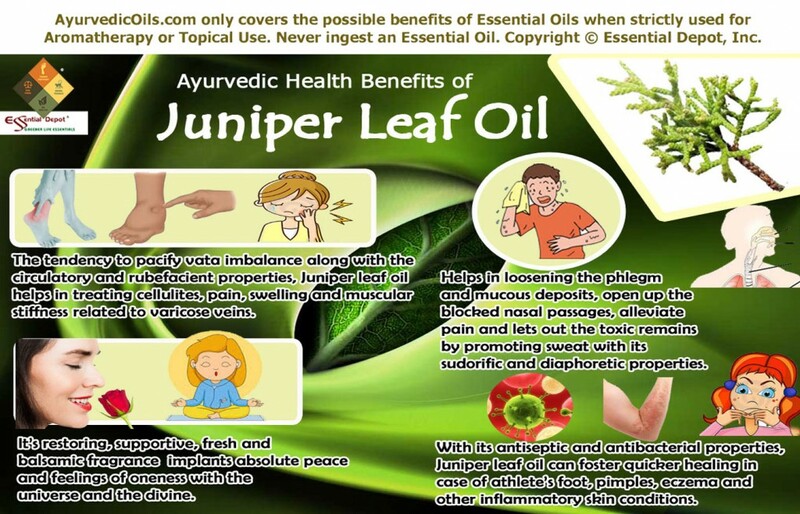 Juniper leaf oil has been used since the traditional times for spiritual and remedial uses. It’s restoring, supportive, fresh, sweet-woody and balsamic fragrance implants absolute peace and feelings of oneness with the universe and the divine. Adding 3 drops of Juniper leaf oil with 1 drop of Clary Sage oil, 1 drop of Vetiver oil and 1 drop of Sandalwood oil in your diffuser, burner, aromatic candle or vaporizer during prayers, meditation and other sacred ceremonies can uplift your mind, nourish your spirit, open up the mind for newness, instill positive feelings and nurture the soul, helping it to identify its purpose on earth. This is only for educational purposes and is not meant for diagnosing any medical condition or for substituting any prescription medicines or expert advice of a medical professional. We are not healthcare experts and this article is shared only with the idea of widening the knowledge of Ayurvedic healing, the pioneer of all medical systems. Juniper leaf essential oil is non-irritant and non-toxic but is still recommended for topical use only. This is because pure and organic essential oils are highly concentrated liquids and may cause allergic reactions if used directly on the skin. Do not take essential oils internally. The essential oil of Juniper leaf should not be used by people with chronic kidney disorders, pregnant and nursing women as it has the potent to cause uterine contractions, making it a traditional medicine for inducing labor. Keep essential oils out of reach of children. A weed is a plant whose virtue is not yet known. –By Ralph Waldo Emerson. This entry was posted in Essential Oils - Learn About and Purchase and tagged Ayurvedic oils for anxiety, Ayurvedic oils for apoptosis, Ayurvedic oils for arthritis, Ayurvedic oils for bronchitis, Ayurvedic oils for cancer, Ayurvedic oils for detoxification, Ayurvedic oils for digestive problems, Ayurvedic oils for edema, Ayurvedic oils for fatigue, Ayurvedic oils for gout, Ayurvedic oils for kidney stones, Ayurvedic oils for obesity, Ayurvedic oils for renal calculi, Ayurvedic oils for rheumatism, Ayurvedic oils for stress, Ayurvedic oils for the soul, Ayurvedic oils for urinary infections, Ayurvedic oils for varicose veins, Ayurvedic remedies for weight loss, Ayurvedic uses of Juniper leaf oil, Chemical constituents of Juniper leaf oil, Health benefits of Juniper leaf oil, Juniper leaf in Ayurveda, Juniperus communis, Therapeutic properties of Juniper leaf oil by AyurvedicOils. Bookmark the permalink.